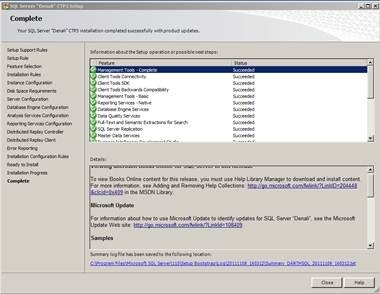 · Click on Installation (left hand side), then click on New SQL Server stand-alone installation or add features to an existing installation. 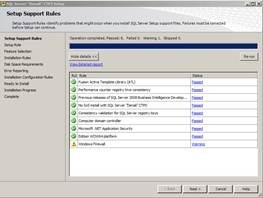 · Setup support rules will identify problems if any. If there are problems fix them else press OK button. · On Product Key choose Evaluation, later you can specify the product key. Press Next button. · Accept the License Terms then click Next button. · Setup files will get installed. There will be a report at the end. Press Next button. · Disk Space Requirements will show up. Press Next button. · Review the Ready to Install information to validate the your selected options. · Wait until installation is completed. · Accept the License terms by clicking the checkbox then click Next button. · Once completed click Finish button. 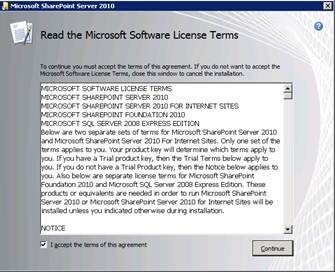 · Accept the License Terms then click Continue button. · Once completed press OK button. 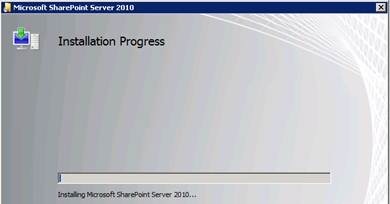 This step will configure your SharePoint farm and install PowerPivot. It will also customize your farm with recommended settings for a PowerPivot installation. a. Launch Microsoft SQL Server setup, click the Installation tab, and then click New SQL Server stand-alone installation or add features to an existing installation. b. On Setup Support Rules page click OK. Once operation is completed click Next. 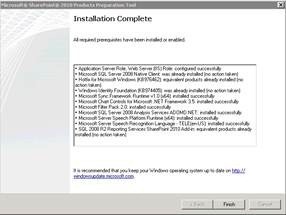 c. On Installation Type page select Perform a new installation of SQL Server “Denali” CTP3, click Next. 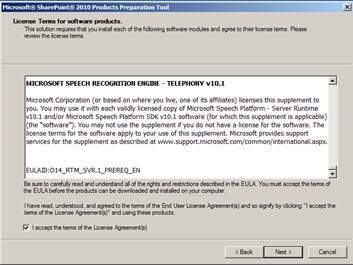 d. Either enters the product key or select free edition when prompted, accept the License Terms and click Next. 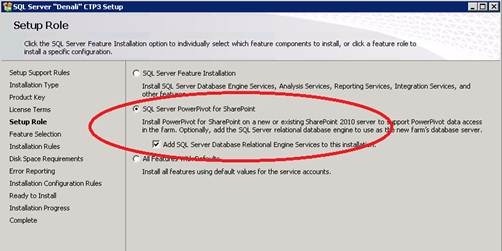 e. On Setup Role page select SQL Server PowerPivot for SharePoint, and then leave the Add SQL Server Database Relational Engine Services to this installation checkbox selected. Click Next. f. On the Feature Selection page you will see all the required features selected, click Next. g. On the Installation Rules page click Next. 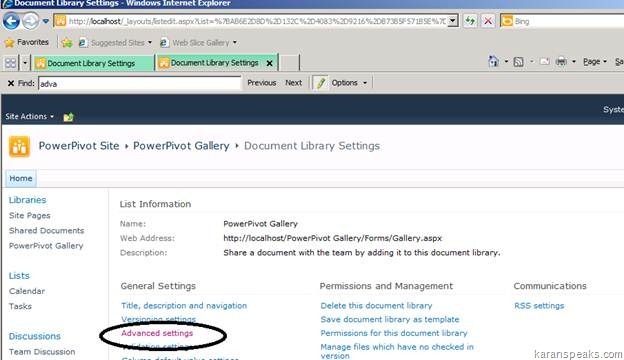 h. On the Instance Configuration page, enter the instance name then click Next. i. On Disk Space Requirements, click Next button. j. On the Server Configuration page, enter service accounts for each SQL Server service. The Analysis Services Service Account must be a domain account. Click Next to go to the Database Engine Configuration page. k. On the Database Engine Configuration page, enter the name of an administrator for SQL Server (you can click Add Current User to ensure that you are a SQL Server admin), then click Next. l. On the Analysis Services Configuration page, enter the name of an administrator for Analysis Services. 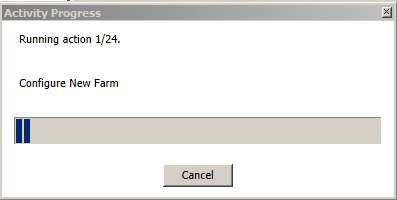 At minimum click Add Current User to the administrators, this is required to ensure that PowerPivot is deployed correctly in the farm. m. Click Next button until you reach Ready to Install page. o. 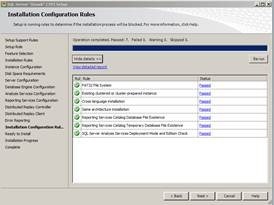 Once complete click Please launch the PowerPivot Configuration Tool to configure the server. 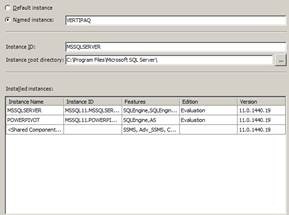 p. On the Complete page of SQL Server “Denali” CTP3 Setup click Close button. 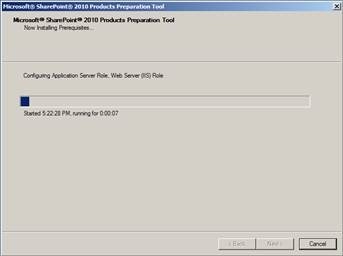 This tool (new in CTP3) performs the SharePoint Integration and configuration steps required for PowerPivot. 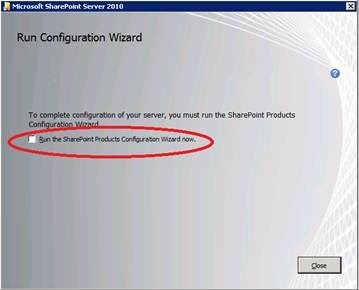 The database server should be the instance you install with SharePoint integration (step 3), you can leave the default port or change it based on your preferences, keep the passphrase handy as you will require it later during the configuration. f. Now click Run button to begin the configuration of your PowerPivot farm. There will be a warning message click Yes button. g. You will see an Activity Progress popup window. j. 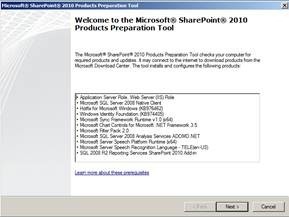 Open SharePoint Central Administration to confirm that SharePoint is installed correctly. 5. 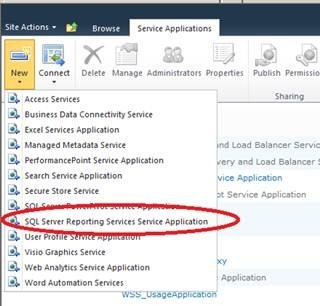 Run SQL Server setup to install Reporting Services for SharePoint and a BISM instance of Analysis Services. 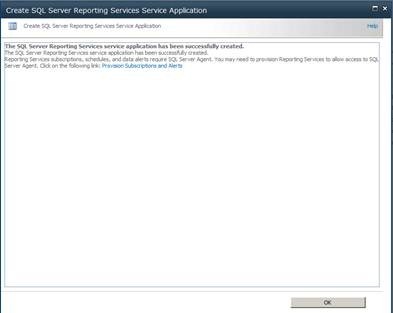 Although you already ran SQL Server Setup once, you now need to run it again to add Reporting Services and an Analysis Services server in VertiPaq mode. The Analysis Services instance will host the business intelligence semantic models that will serve as data sources for the “Crescent reports” you create. b. Continue through Setup, selecting the defaults until you get to the Installation Type page. On this page, make sure Perform a new installation of SQL Server “Denali” CTP3 is selected. 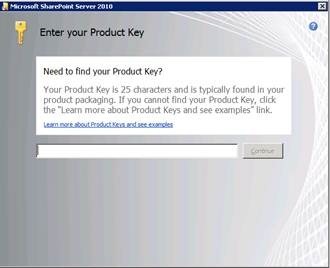 c. Enter the product key when prompted and navigate through Setup, selecting the defaults until you reach the Setup Role page. 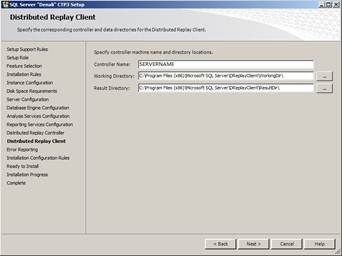 d. Select SQL Server Feature Installation (the default) and click next. 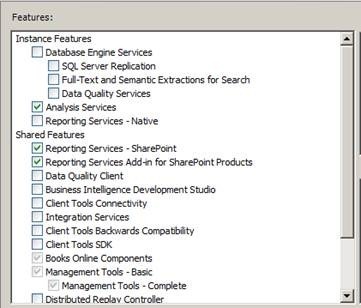 e. On the Feature Selection page, select Analysis Services, Reporting Services – SharePoint and Reporting Services Add-in for SharePoint Products. Click Next twice. g. Click Next on the Disk Space Requirements page. h. On the Server Configuration page enter a service account for SQL Server Analysis Services. The following screenshot shows a domain user account, but for an Analysis Services server in VertiPaq mode, you can also use the default virtual account provided by Setup. i. On the Analysis Services Configuration page, enter the name of an administrator for Analysis Services. To ensure that you are (or the account you are using is) an Analysis Services Administrator, click Add Current User. Click Add if you want to add additional users as administrator. You should add anyone who will perform processing operations on the server. 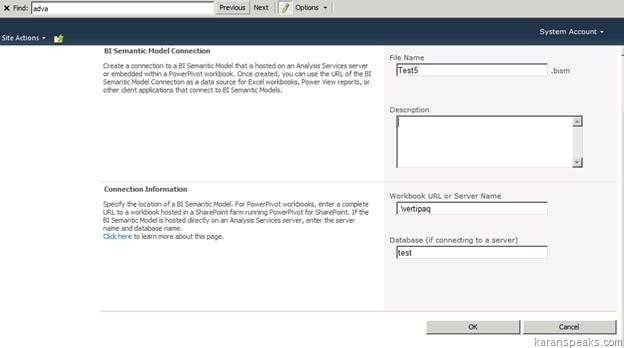 Also select BI Semantic Model as your Analysis Services Deployment mode. Click Next when you are finished. 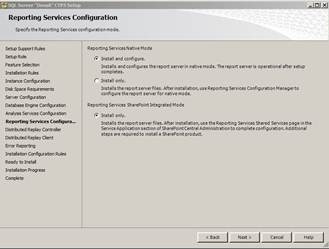 j. Click Next on Reporting Services Configuration page. k. Click Next until you are on Ready to install page, click Install button. l. Close the SQL Setup window. 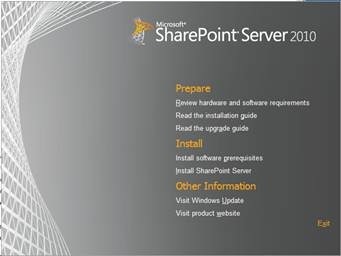 a. Click SharePoint Central Administration > Application Management > Manage service applications. b. Click New > SQL Server Reporting Services Service Application. c. Specify a name for the service application and an application pool that this service will run under. While you can use an existing application pool such as Web Services Default, consider creating a new application pool to isolate Reporting Services from other web services like Excel Services and Secure Store Service. f. Your installation is complete and your server is configured and ready to use. I had hard time in performing these steps in the absence of Screen Shots, so thought of adding this post with Screen Shots. A BI semantic model connection is created in SharePoint and provides redirection to business intelligence semantic model data in a PowerPivot workbook or Analysis Services tabular model database on a network server. 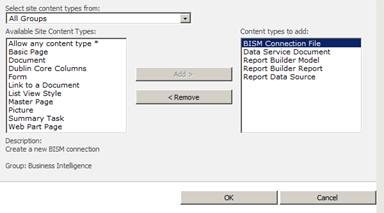 Before you can create a BI semantic model connection in SharePoint, you must extend a document library to allow the creation of a .bism file. This step only needs to be performed once for each library, but you will need to repeat it for any library from which you want to create .bism files. Best practices recommend that you create a centralized library for storing .bism files so that you can manage permissions in one place. If you already use SharePoint Data Connection Libraries, the BI Semantic Model Connection content type is automatically added to that library template. You can skip the steps in this section if you use a data connection library that already lets you create new BI semantic model connection documents. 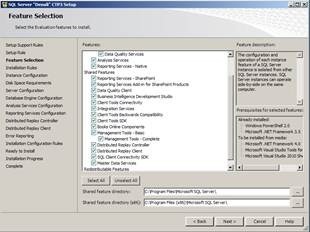 You must have at least the Manage Lists permission to add and configure a content type. This permission is built into the Design permission level and above. 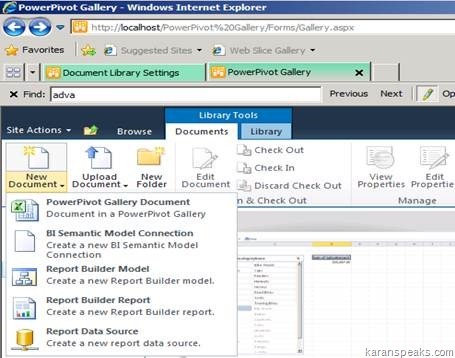 Open the document library for which you want to enable the BI Semantic Model Connection content type. 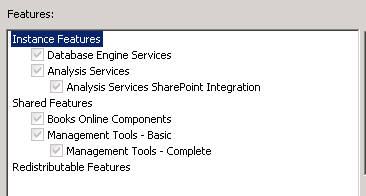 On the SharePoint ribbon, in Library Tools, click Library. In General Settings, click Advanced settings.